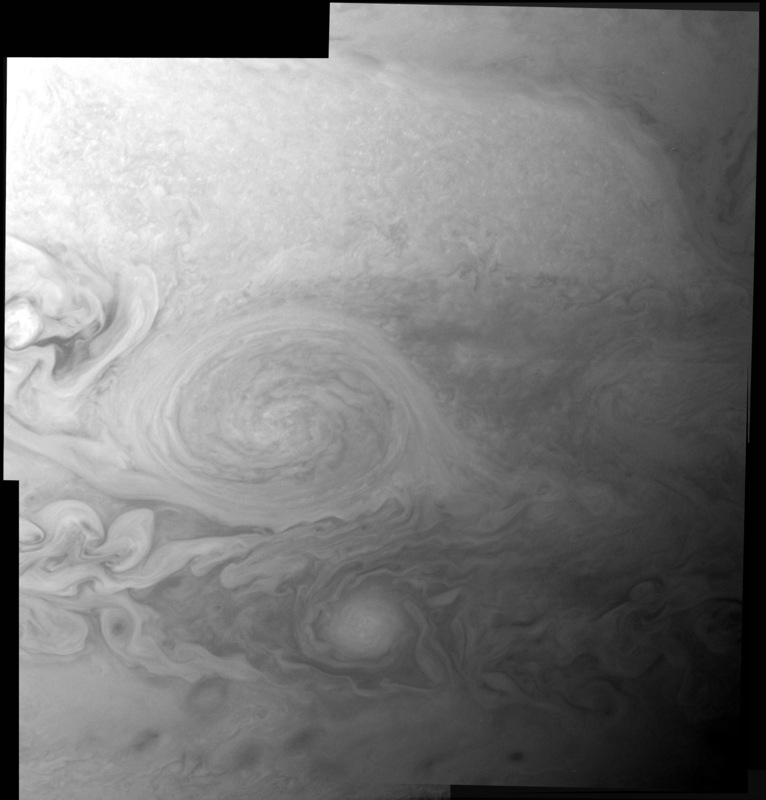 The New Horizons Long Range Reconnaissance Imager (LORRI) has returned stunning new images of Jupiter's Little Red Spot, obtained as a 2-by-2 mosaic at 0312 UTC on February 27, 2007, from a distance of 3 million kilometers (1.8 million miles). The image scale is 15 kilometers (about 9 miles) per pixel. By comparison, team members say, ground-based and Earth-orbiting imagers rarely do better than 200-kilometer (130-mile) resolution on Jupiter. "These LORRI images of the Little Red Spot are amazing in their detail," says New Horizons Project Scientist Dr. Hal Weaver, of the Johns Hopkins University Applied Physics Laboratory, where the spacecraft and LORRI camera were designed and built. "They show the early stages of this newly reddened storm system with a resolution that far surpasses anything available until now." LORRI took this mosaic 9� hours - or not quite one Jupiter rotation period - after snapping its previous images of the Little Red Spot on Feb 26, 2007, at a longer range of 3.5 million kilometers (2.2 million miles) and at a lower resolution of 17 kilometers (10.5 miles) per pixel. The new mosaic was obtained with the Little Red Spot closer to the center of the visible disk of Jupiter, so there is less foreshortening and better illumination. The Little Red Spot is an Earth-sized storm on Jupiter that changed its color from white to red in 2005. Swimming to the east, its clouds rotate counterclockwise (or in the anticyclonic direction), meaning that it is a high-pressure region. In that sense, the Little Red Spot is the opposite of a hurricane on Earth, which is a low-pressure region - and it is of course much larger than any hurricane on Earth. Scientists don't know exactly how or why the storm turned red - though they speculate that the change could stem from a surge of exotic compounds from deep within Jupiter, caused by an intensification of the storm system. In particular, sulfur-bearing cloud droplets might have been propelled about 50 kilometers into the upper level of ammonia clouds, where brighter sunlight bathing the cloud tops released the red-hued sulfur embedded in the droplets - causing the storm to turn red. A similar mechanism has been proposed for the Little Red Spot's "big brother," the Great Red Spot, a massive energetic storm system that has existed for centuries. The smaller, brighter oval to the south of the Little Red Spot is another storm moving more rapidly to the east, as can be seen by comparing the previous mosaic to the newer one. Any feature that moved by as much as 100 pixels between the earlier mosaic and the new one - as many features have done - has shifted at an average relative speed faster than 95 miles per hour, indicating hurricane force winds. The awesome violence of the storms in Jupiter's atmosphere contrasts with the serene isolation of New Horizons' LORRI, snapping pictures from millions of miles away. "The new images are further proof that LORRI is one of the best imagers ever flown on a planetary mission," says Dr. Andy Cheng, the LORRI principal investigator from the Applied Physics Laboratory, "and more delights are yet to come."